Let Mature Skin Glow with Beauty and Grace, Flaunt a Clear Look and Invite an Illumined Complexion! 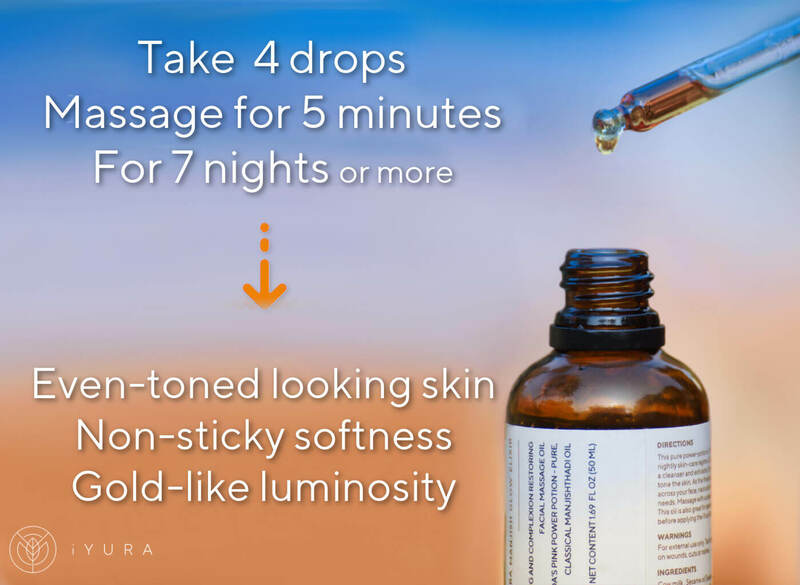 Use 4 Drops for 5 Minutes for 7 Nights or More! What is this that the texts speak so highly of? What’s so powerful about it? How does it bring out a metaphoric gold-like glow? 4 drops, 5 minutes every night and you won't want makeup! A gorgeous brick red elixir, this is indeed an object of fascination, but one which delivers powerful results! With this oil, a glow is really only a bonus! A beautiful elixir is actually specifically meant for patchy as well as dull and uneven looking skin tone and those who're not very keen to use heavy oils on the face. If you break out by just the thought of oil on your face, but your heart breaks that you can’t use one, you would love to try this elixir! This oil is not just another face oil. Based on ancient Ayurvedic principles, this oil works nightly to help ease the appearance of uneven spots, provide a clean and clear look and boost a more youthful look. It makes the face glow as if it was gold! No - it won't give you the Midas touch and you won't turn golden or anything - but yes. it will give you an instant glow that will be reminiscent of the purity and the irresistible golden sheen of pure gold. A natural, healthy glow comes as an immediate outcome of using this elixir to moisturize your skin. Get your very own Pink Power Potion! I’m very pleased with the quality of products. This Elixer has made my skin feel so smooth and vibrant in just a week. It has the smell of sesame oil at first but does not linger. After turning 60 and having a bit of of a rough go the first few months, I saw the Glow Elixir and thought I would give it a try. I try a lot of different things on my face! After about two weeks of using the Glow Elixir in the evening and the Kasaradi oil in the mornings, my skin has calmed down, evened out in color and has never been quite this smooth. I feel my skin looks so good right now that I went with a REALLY short hair cut, which shows a lot more of my skin. It's just so easy to use! My skin is so soft. I love the way it feels. I am very surprised at how much I love this oil. It makes my skin feel so soft and I can already see a change. I've only been using this for two weeks, but noticed how different my skin felt the first week. But what is it about this oil that makes it so effective and thus, highly valued? To learn how it does what it does, let’s delve deeper into its color. The wondrous herb that lends this oil its lovely color is called ‘Manjishtha’ or Indian Madder. 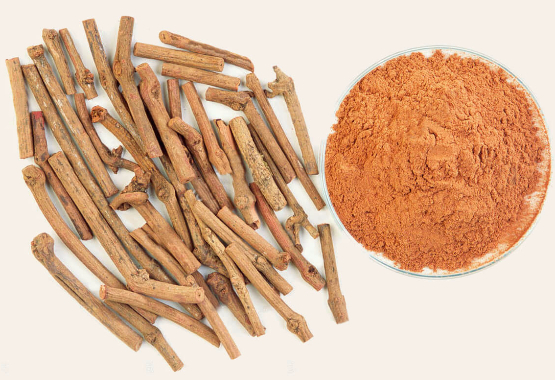 The name of this herb, which is known to be a trustable ally of women, is literally translated into “bright red” and refers to its red roots. 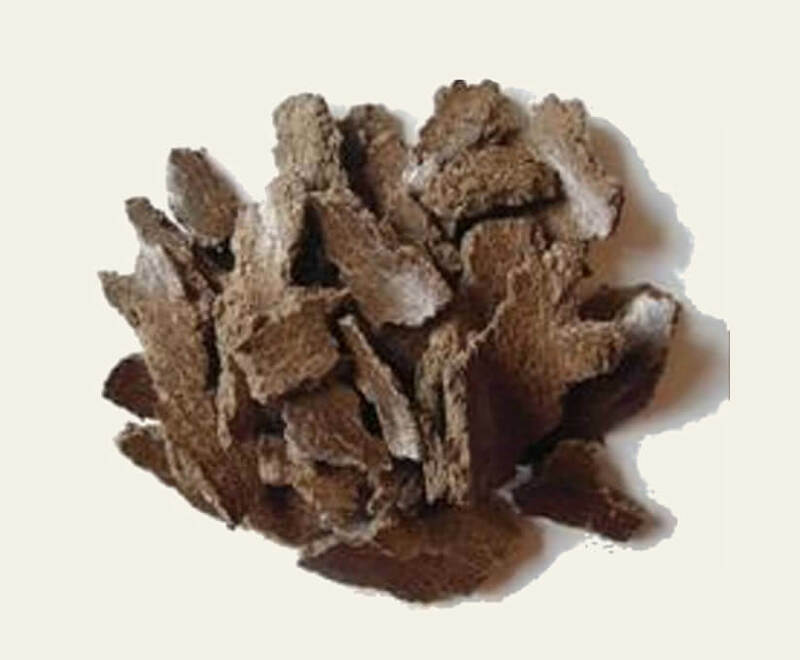 Manjishtha is a common ingredient in Ayurvedic skincare and can be the herb of choice for those seeking a clear, clean look. A celebrated rejuvenative and complexion enhancer, it helps the skin in balancing the skin's temper-tantrums and uneven skin tone. It is often added to face-care products to make the complexion even and tone down the appearance of uneven spots to give a relatively more even-looking complexion. If your skin reminds you of angry, teenage days, Manjistha is like a soothing breeze of maturity and patience which boosts rather than smothers youthful exuberance! The Secret of the Pink Oil... yours to discover now! Ayurveda uses this plant in many formulations that are aimed at balancing Pitta (or the element of heat). As a part of a skin-care oil, it has great benefits as a Pitta-pacifier (as a cooling, balancing, soothing herb). 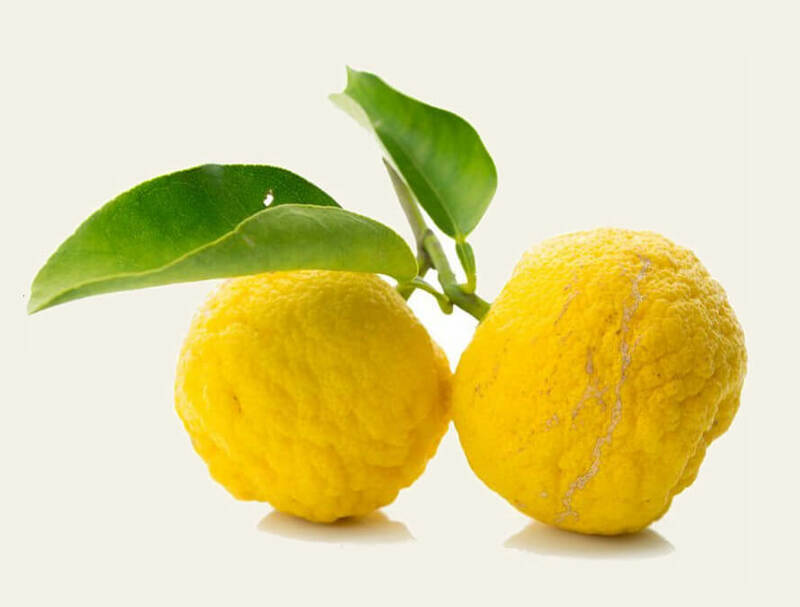 It also brings the clearing benefits of citrus for skin that appears clogged up. It also helps provide a lovely luster to give that glowy look! Mahua longifolia is an Indian tropical tree found largely in the central and north Indian plains and forests. Also known as the Butter Tree or Honey Tree, it’s locally known as the ‘Mahua’ tree and is loved by the locals for the numerous benefits it has! Its seeds are used to obtain a yellow, butter like liquid used as fat. This butter melts immediately upon contact with the skin. It is believed that Mahua Butter keeps drying of the skin at bay and may tone down the appearance of wrinkles and restores the skin's radiance. BUT, this formulation does not contain this butter - and this is where it get interesting! Interestingly, the part of this tree used in our recipe is neither the flowers nor the leaves or the butter from the seeds, this formulation uses the bark instead! This recipe contains Butter Tree Bark, which, as modern research shows, contains 2 active ingredients particularly good for the skin, enabling rejuvenation and a youthful appearance. Isn’t it wonderful how thousands of years ago, when there were no ‘lab tests’, this choice of using the bark rather than the other parts of the tree was made keeping in mind its unique properties?! Always perform a patch test to test for allergies. For external use only. Contains cow milk. Not tested on animals. This oil is not meant to treat, cure, prevent or mitigate any disease. Using 4 drops of Manjish Glow Elixir™ to massage the face for 5 minutes for a minimum of 7 consecutive nights will make you see noticeable change in your skin! This pure power-potion or ‘Pink Oil’ should be used once at night, before going to bed. Cleanse your face as usual. You can use iYURA Rochis™ , which is a cleanser, exfoliator and mask. Spray your favorite toner on your face to tone the skin. Take 4 drops of Manjish Glow Elixir™ in your palm and gently dab across your face, neck and décolleté. Take more or fewer drops to suit your moisturization needs. Massage for 5 minutes with outward & upward strokes until it gets completely absorbed in the skin. Do continuously for 7 nights or more and notice a difference! Always check the ingredients for allergies and perform a patch test. Results may vary from person to person. This oil is also great for specialized facial massage and can give excellent results as a massage oil as a part of a facial. - Compliments on such well-maintained, youthful, dewy skin! I use this every day! My skin feels soft and looks better. I really like this product. Amazing. It is a beautiful product. How is Manjish Glow Elixir™ different from other face oils? It is not just another face oil that smells like flowers and makes your face feel nice and soft. With no added fragrance, it is based on Ayurvedic principles that date back hundreds of years! This oil is a very potent concoction of exotic herbs meticulously cooked by following the Ayurvedic procedures recommended in ancient Ayurvedic texts - not a simplistic combination of essential oils and a base oil. 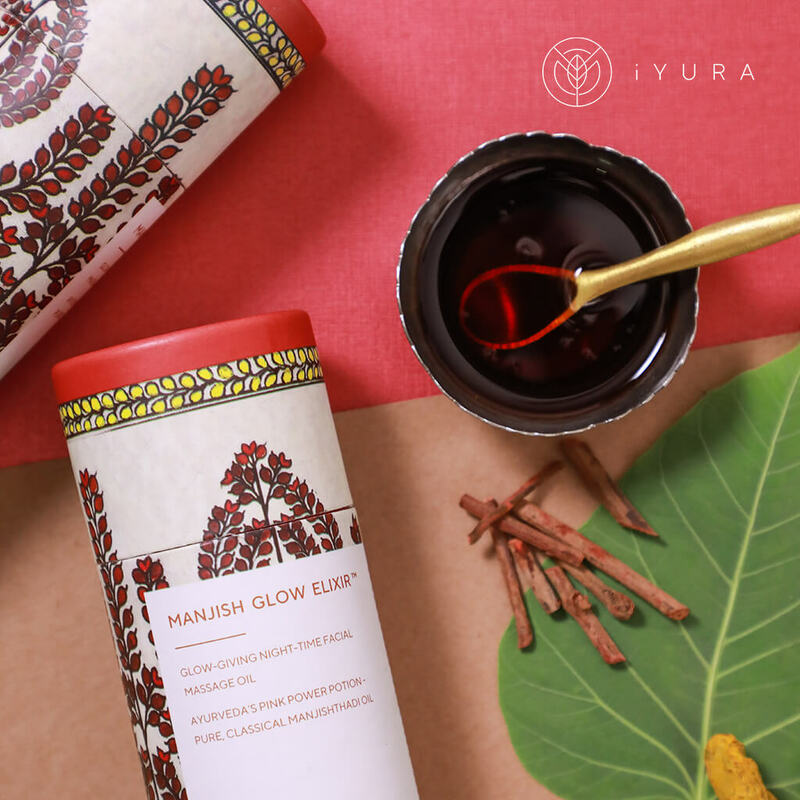 Manjish Glow Elixir™ is a unique oil which uses the strength of 5 powerful herbs which are not easily available here in the West, that work in different ways to bring out a clear-looking, even complexion. A pure Ayurvedic formulation only pure Ayurvedic herbs- there’s nothing hidden from you. A lot of companies alter formulations by adding ingredients without communicating the same or do not use herbs in the right concentration. With iYURA Classical products, you’re assured this will not happen. This oil is very light, non-sticky and free of any added fragrance. It’s the kind of oil which will disappear into your skin but will still give you a sort of softness that's different than what a cream gives! It works quietly at night as you sleep so you wake up to clear, refreshed skin! This oil is free of any chemicals, binders, mineral oils, additives, parabens, petroleum, silicone etc. 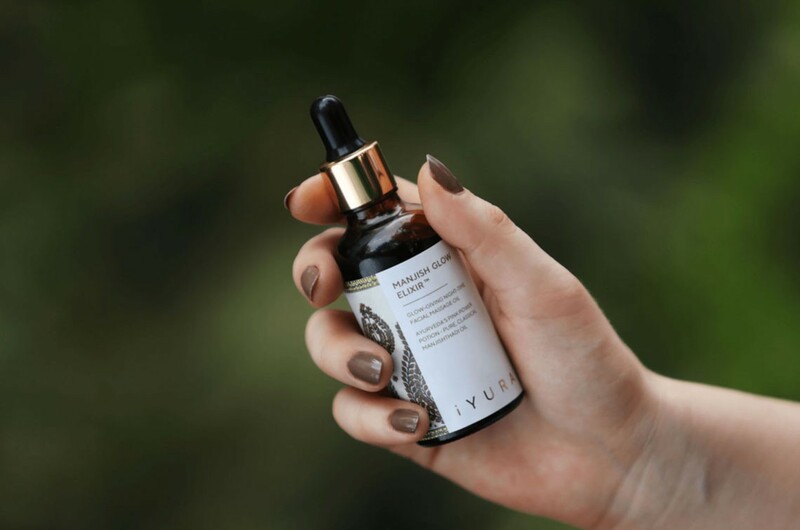 If you already have another iYURA Facial Oil, is this oil still worth purchasing? Absolutely! 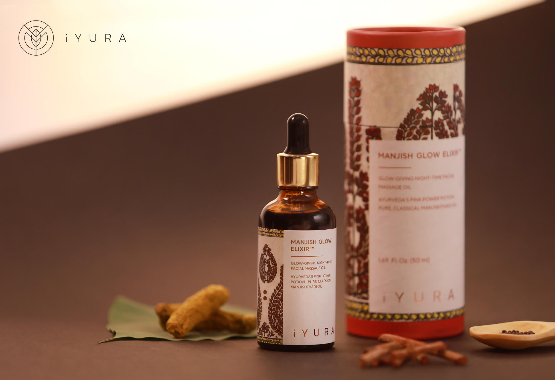 iYURA Manjish Glow Elixir™ is our Night oil, to be used for facial massage at night. Our other face oils can be used during the day, under a sunscreen. 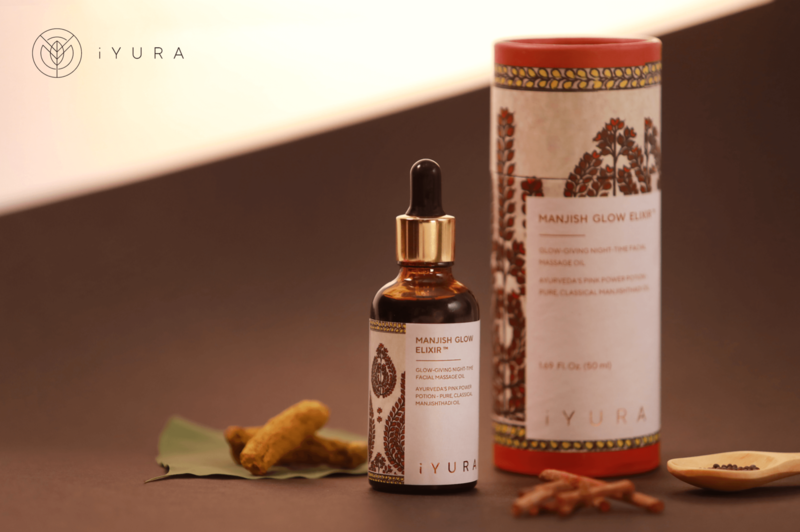 In fact, Manjish Glow Elixir™ pairs wonderfully with iYURA Kesaradi™ to complete your day and night skin-care regime. If you specifically want to smoothen the appearance of uneven skin and want a very light oil, this oil will work in a targeted manner at night. During the day, get added nutritive benefits from our day oil but at night, let Manjish Glow Elixir™ work and see if it makes a difference in 7 nights or more! "Since adding this to my nighttime routine, I’ve had multiple people comment on my skin. Several asked what makeup I used. When I told them it wasn’t the makeup, but my facial oils that make my skin smooth and poreless, they all wanted the link. I’ve also noticed all my hormonal breakouts have subsided. At 42, this is the best skin I’ve ever had!" I am 67 years old and my skin tone has become uneven. I noticed within a week that my skin tone was much more even. I also love how silky my skin feels now. I recommend this product. Perfect Experience! 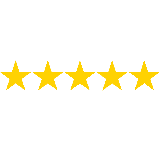 I love this product and will continue to use it as long as it is available. iYURA’s Manjish Glow Elixir™ is a part of iYURA’s Classical-Inspirations Collection of products. 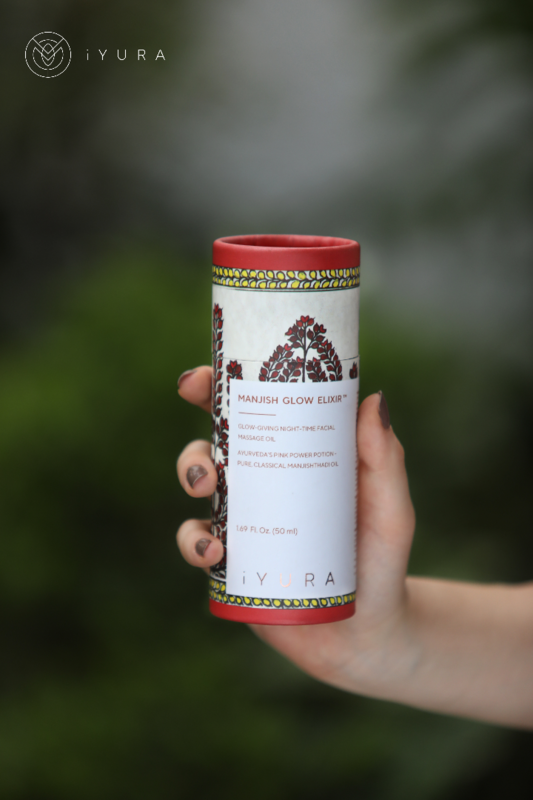 You can identify iYURA’s classical products at the very first look! 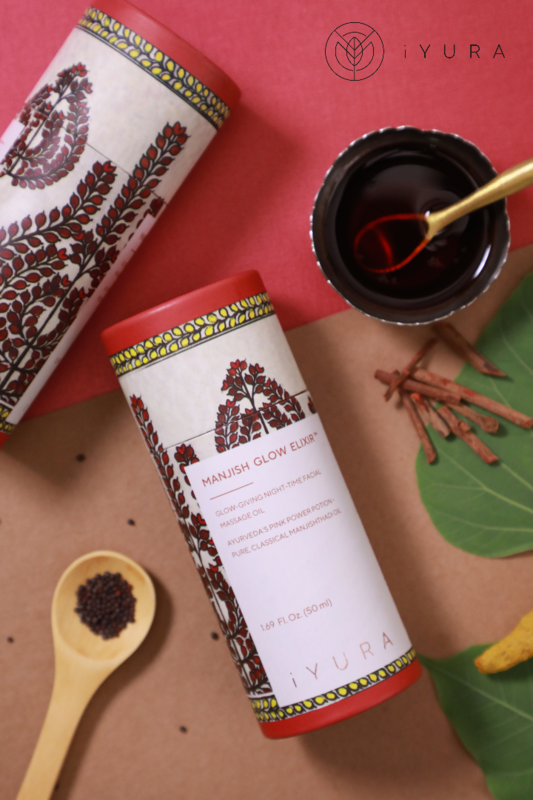 See the hand-painted, ‘Madhubani’ artwork on the package? But why do they look different from our Essentials range? What’s different about them? ‘Madhubani’ painting is a style of painting unique to the Mithila region in Northern India. 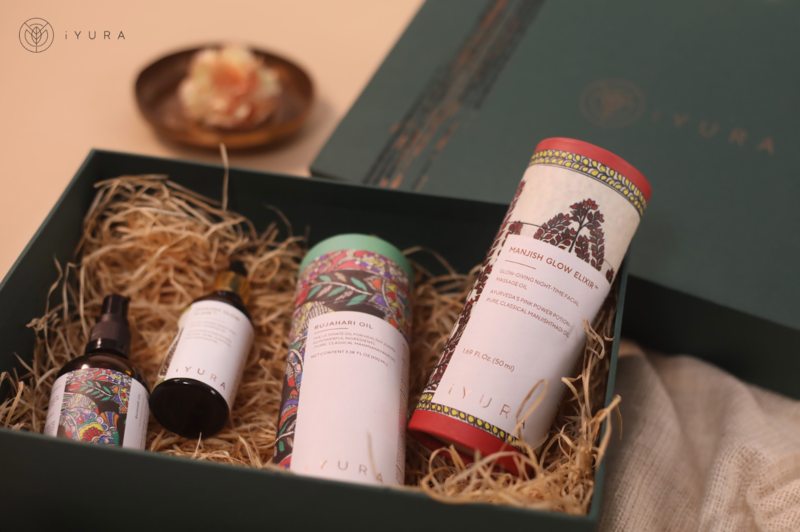 This kind of artwork, hand-painted by artisans, not only makes iYURA Classical-Inspirations products uniquely identifiable at just one look, but they also place the products in the ancient, rich, cultural context they belong to. Each of these products has a very specific purpose. 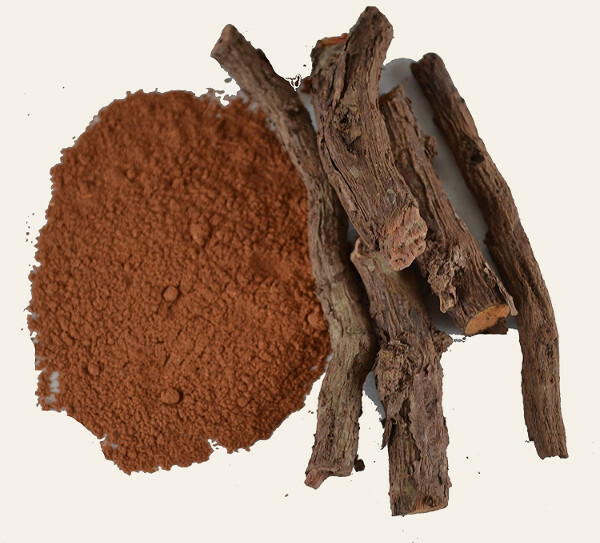 It is evident in the herbal nature of their aroma that a wide variety of intensive herbs have been used in these formulations. To keep their purity, effectivity and sanctity intact, we do not add any fragrance or even essential oils to these products. These products are made in GMP and ISO certified facility and tested for cosmetic safety standards. If, under a rare circumstance, for any reason you feel that you’d like to return a product, simply write back to us and we will ensure you’re refunded. One peel can cost anything from $100 to $500. The damage it does to the vitality of your skin? Not measurable! But say, you're already over that and don't use chemical stuff and already choose natural over other stuff available out there. Then you should know that one specialized Ayurvedic facial at a spa can cost anything from $60 to $200. That’s 1 single 1-hour session. Now, problems like acne, blemishes and uneven skin tone don't get resolved in a single one-hour session. You need at least 4 sessions, which means anything between $400 - $2000! You're getting this premium elixir for less than $45 and it will probably last you anything from 3 months to a year, depending on how much you use! Just 4 drops every day are enough, but use as much as you like, cause you're saving hundreds of dollars by investing in just 1 bottle! 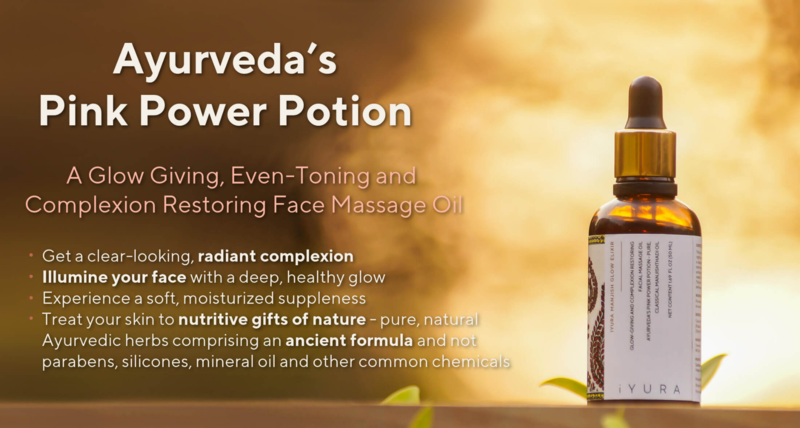 As far as other Ayurvedic products are concerned, here, you need to be a bit more aware - most skin care lines are 'Ayurveda-inspired'. While there's nothing wrong with that, targeted, focused, specific results only come from specialized, classical formulations which have passed the test of time and have had several researches and studies feature their effects. With iYURA's skin care products, you have a thesis based on thousands of years of use! Also, the ingredients that go into these formulations, firstly, are not easily accessible here in the West, and secondly, even if they are, they're quite expensive. To put them together and get the right results requires another level of expertise. All of this has been simplified for you - put in a bottle which is affordable, easy to use and ensures your satisfaction. With our 100% satisfaction, 30-Day Money Back Guarantee, you should really be loading your cart by now!